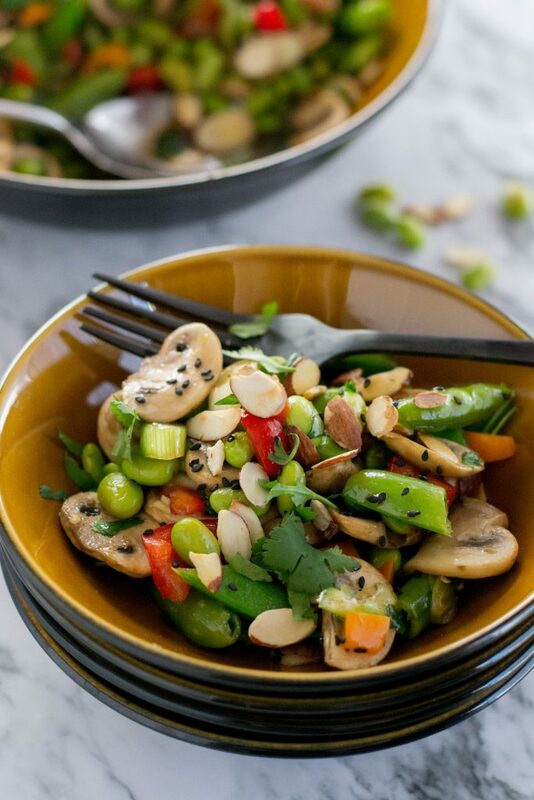 Asian Edamame Salad - What the Forks for Dinner? I think I may be in a sugar coma……ugh!! The holidays have gotten the best of me. I actually am craving something good!! Asian Edamame Salad is a refreshing change after this past month. Having been on a sugar frenzy for the past month, my body needs a change. Both Tim and I are ready to get back to better eating habits. More fresh….a lot less sugar! If you live in the midwest you know that a deep freeze has set in……I deplore cold weather…..ugh! I had big plans to get a few things done…. groceries, return a gift, drop off some items at a local Goodwill, and maybe a mani-pedi. That was until I opened the door to let the girls out. It’s so cold it takes your breath away. I chose to stay home. Last day of Winter Break, back to the alarm and work tomorrow. So staying home and not freezing my lungs sounded like a good plan. Poor Tim had to work so, he got grocery duty….sorry babe! We needed lunch and I wanted today to start a good food trend. Scouring the pantry and frog, I discovered there really were some yummy healthy things in there. I had edamame in the freezer, left over peppers and mushrooms that I had bought for a recipe I never made…maybe later. I also found sugar snap peas…that I was sure I would eat instead of chips or cookies….lol, and left over almonds from baking. It was a good start. Not being a fan of raw mushrooms, I sautéd them. Since it is so cold maybe a warm salad? Just to take the chill off I sautéd the edamame, peas, and peppers. 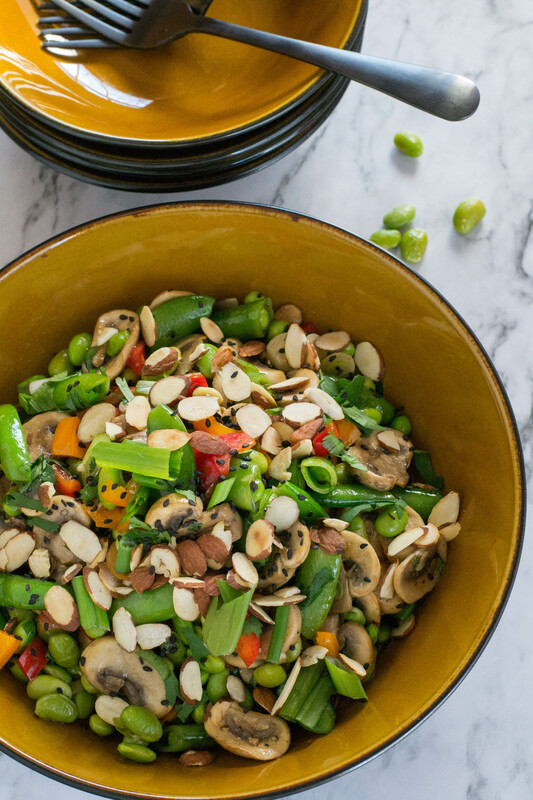 Sriracha added a touch of heat, and the almonds a touch of crunch. 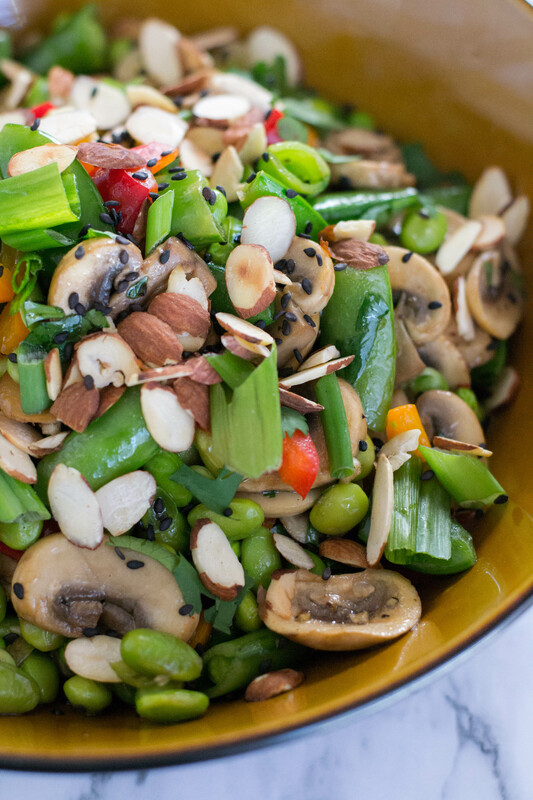 Asian Edamame Salad came together quickly, after tasting it I decide that it needed a dressing. A quick vinaigrette with soy sauce, ginger, garlic, rice wine vinegar, and honey. 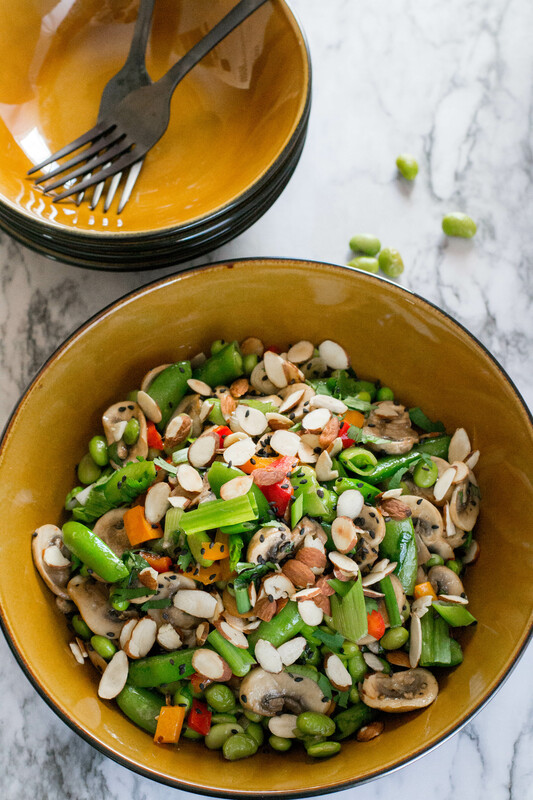 Toss in the dressing while the ingredients are still warm lets the flavors seep in and gives delicious flavor to the salad. 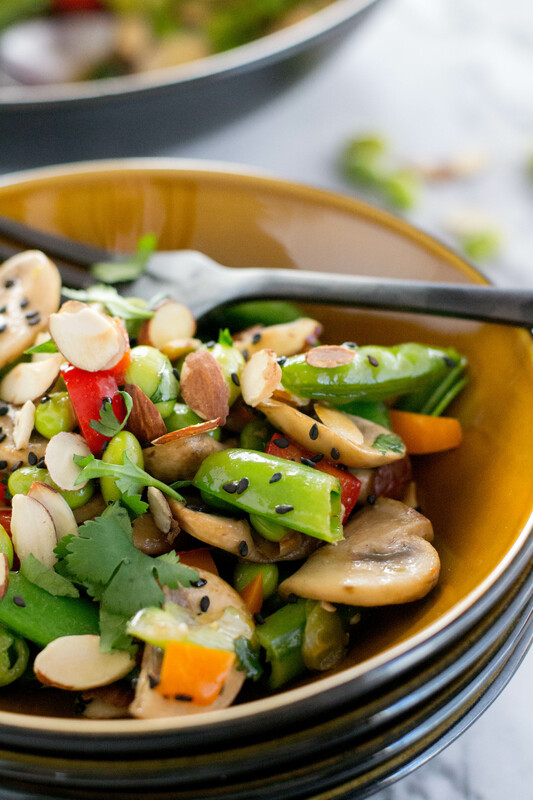 Garnish with cilantro, green onions, and sesame seeds. 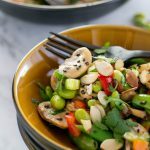 Asian Edamame Salad is a great salad to get rid of the holiday hangover, and get back on track for 2108. Although I am not looking forward to the 4:30 am alarm I am looking forward to my lunch tomorrow…salad of course! In the same sauté pan add remaining 1 tablespoon oil to pan. Cook edamame, snap peas, and peppers, stirring occasionally until the peas are tender and edamame is bright green, 3-5 minutes. Stir in Sriracha, and mushrooms and cook stirring, until heated through. Season with salt and pepper. Remove from heat and stir in dressing and almonds. Garnish with cilantro, green onions, and sesame seeds. Can be serve hot or cold. In a glass jar combine all ingredients and shake well to blend.